Laminitis is a very painful, debilitating condition. It occurs when the Laminae ( a layer of keratinized epidermal and dermal tissue) which connects the hoof wall to the coffin bone separates. Laminitis can cause structural changes in the horse’s hoof resulting in lameness. Untreated, the coffin bone may eventually puncture the sole of the hoof and the horse is euthanized. Laminitis has been researched for years, but so far it continues to be a devastating disease. However, researchers have found 10 warning signs of Laminitis even before you detect lameness in your horse. A strong digital pulse – Check the digital artery which can be felt down the back of the fetlock. The pulse should be faint or even absent. If it is strong, your horse should be seen by the vet as it can be an indication of laminitis. Increased heart rate – A normal resting heart rate in horses is 30-40 beats per minute. Even a mild increase in heart rate can indicate a problem. 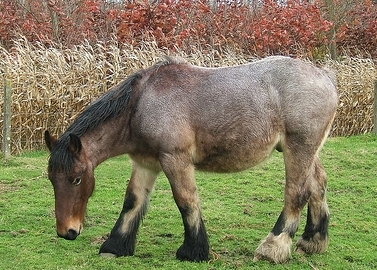 Stretched or bleeding laminae – The white line where sole and hoof wall meet widens and/or flecks of blood are visible. Horses with laminitis may shorten their stride on hard ground when turning. Increased insulin levels which should be 20 units or less. Between 20 and 40 units, an oral glucose test is recommended. Over 40 units, insulin must be lowered before laminitis is found. Obesity – Excess weight can cause wearing down of feet but can also mean the foot is breaking down. Diarrhea, infection, any inflammation can trigger laminitis. 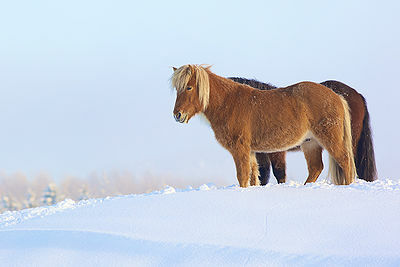 Consult with your vet about packing the feet in ice to keep laminitis at bay. Laminitis is not easily detectable in its early stages, but learning the subtle signs at its low level can prevent it from worsening. Learn your horse’s normal stance, behavior, temperature and heart rate. Then you will be more aware of any changes and can contact your vet immediately.